The full size TigerChef 34-Piece Disposable Buffet Chafer Serving Kit and Serving Utensils set is a great addition to any catered event, outdoor party or holiday affair. Whether you need to supplement your buffet table with additional chafing dishes, or you need a disposable chafer serving set for a one off event, this economically priced chafer serving kit is just the right alternative to traditional chafers. Perfect for catering operations that specialize in off-premises events such as tailgating parties, catered picnics, and at-home parties, this disposable chafer kit is simple to set up and use. And, it includes all the pieces you will need to keep your food warm and ready to serve, so you will never have to worry about forgetting a component of your chafing dish. In addition, it is completely disposable, so you can simply throw it all away at the end of your event without leaving any mess to clean up behind you. This full size chafer set includes a wire chafing rack that can hold 2 cans of gel fuel (included); a full-size water pan and two half-size food pans, so you can mix and match your food offerings. The chafing fuel cans snap securely into the wire chafing rack to keep your food warm and the gel fuel is easy to ignite and long-lasting. For touch-free service each complete set also includes (2) disposable serving spoons and serving forks, and (1) disposable serving tong. 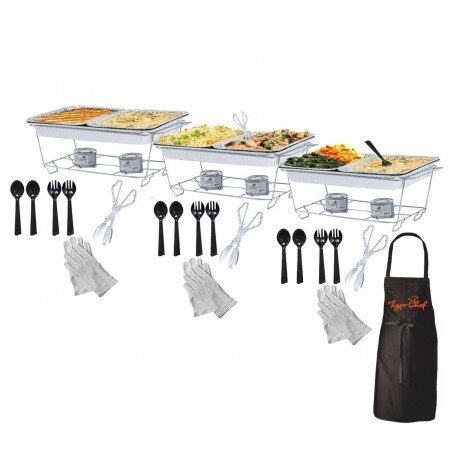 To help keep your servers tidy, it also includes a TigerChef apron and one pair of white waitress gloves per set, to add a touch of class to your serving style. came faster than I expected and was very decently priced. Everything that's needed for this set was included. I was very pleased with the buffet set. Everything was good quality and washed well. This is just what we needed for our baby shower. Delivery was super fast and the price was really great for so many items. This set comes with tons of stuff! It worked out great for our BBQ. We had some extras we were able to store for the next one. The price was great too. This is an amazing deal for what you get. The quality is good and I love that it comes with the fuel! I always forget the little details so it saved me that last minute trip out before my party. How many trays it would be?